Numbers matching, L48/350 motor, 92,000 original miles, four speed manual transmission, buckskin leather interior, power steering, power brakes, power windows, tilt and tele steering column, alloy wheels, AM/FM/CD radio, chrome valve covers, A/C, chrome air cleaner, Hurst shifter, dual chambered exhaust, and much more. We replaced the front brake caliper, front brake pads, 4 rubber brake hoses, emergency brake cable, fan clutch, thermostat and gasket, water pump, power steering control valve, power steering hoses, complete distributor, sway bar links, and much more. We also changed the oil and filter and checked and lubed the chassis. This corvette sounds awesome and is a lot of fun to drive. 1977 was the last year for the short back window in the C3 series. 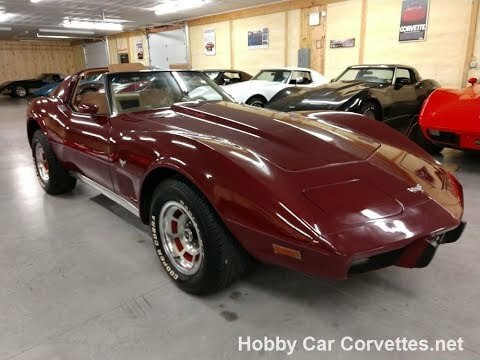 For some interesting history on the 1977 corvette click here. Just Arrived Check out the video! I would like to subscribe to the Hobby Car Corvettes Monthly Newsletter and Alerts about new Corvettes.